M/C dislocation of the foot at tarsal-metatarsal articulation (Lisfranc joint). Direct impact or landing and plantar or dorsal flexing the foot. Lisfranc ligament holding 2nd MT base and 1st Cu is torn. Manifests with or w/o fracture-avulsion. 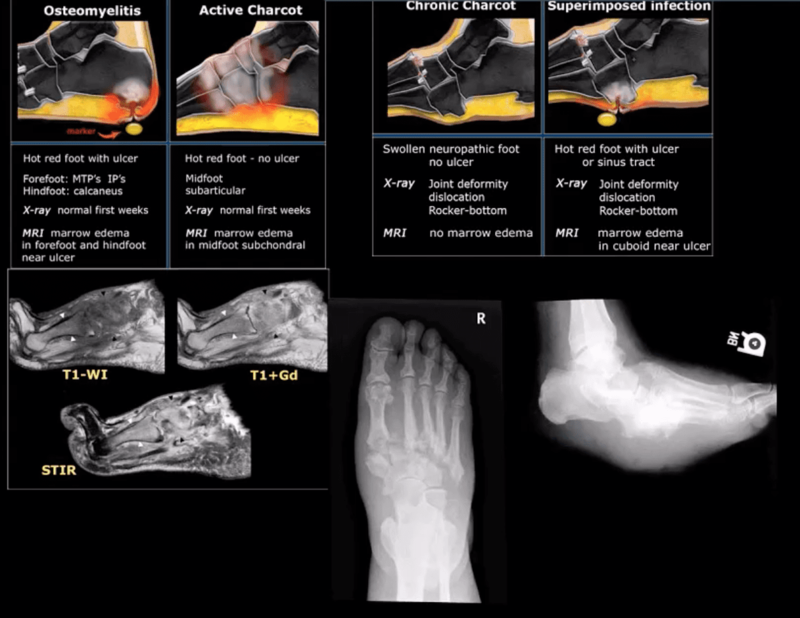 Imaging: 1st step: foot radiography in most cases sufficient to Dx. MSK US may help: show disrupted Cu1-Cu2. Ligament and widened space > 2.5mm. MRI may help but not essential. Weight-bearing view aids Dx. Common. Non-traumatic found in superior-medial talar dome. Traumatic may affect supero-lateral dome. Clinically: pain/effusion/locking. Imaging is crucial. 1st step: radiography may reveal focal radiolucent concavity/halo, fragment. MRI helpful esp. if OCD is cartilaginous and to demonstrate bone edema. Management: non-operative: short-leg cast/immonbilization-4-6 wk. operative: arthrocsopic removal. 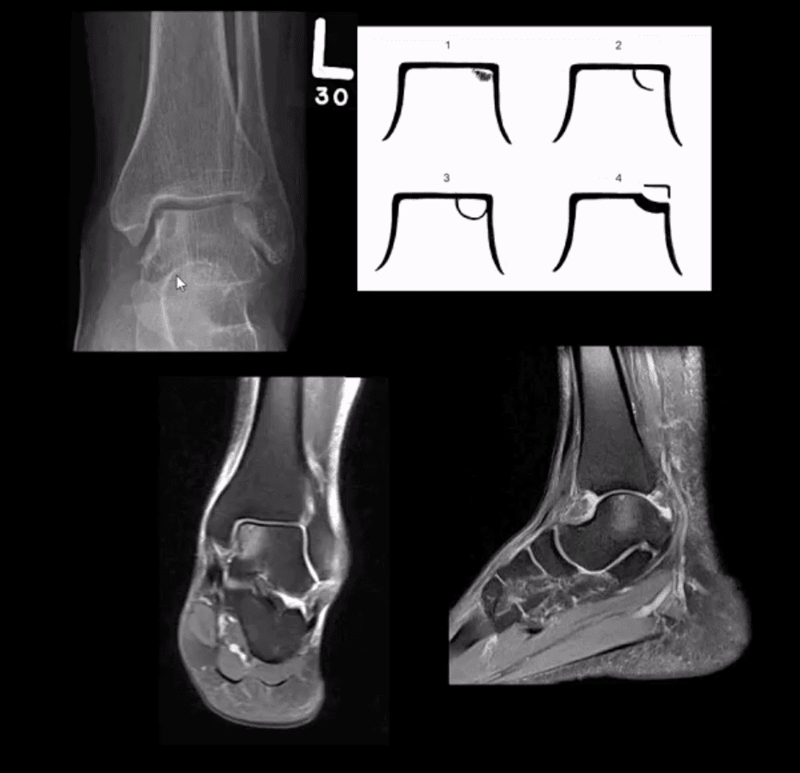 Acute & Stress fractures are common: m/c 5th MT & 2nd, 3rd MT. Jones Fx: extra-articular Fx of proximal metaphysis of the 5th MT. Prone to non-union. Often fixed operatively. Pseudo-Jones: intra-articular avulsion of 5th MT styloid/base by eccentric contraction of Peroneus Brevis M. Managed conservatively: boot-cast immobilization. 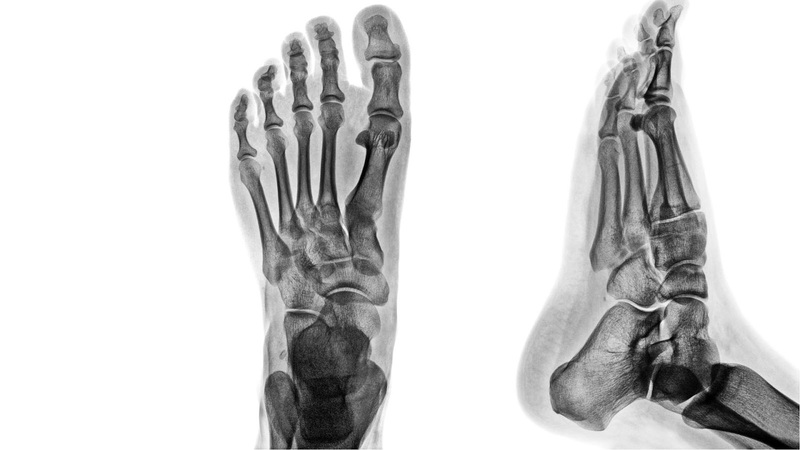 Both Jones & Pseudo-Jones Dx by foot series radiography. 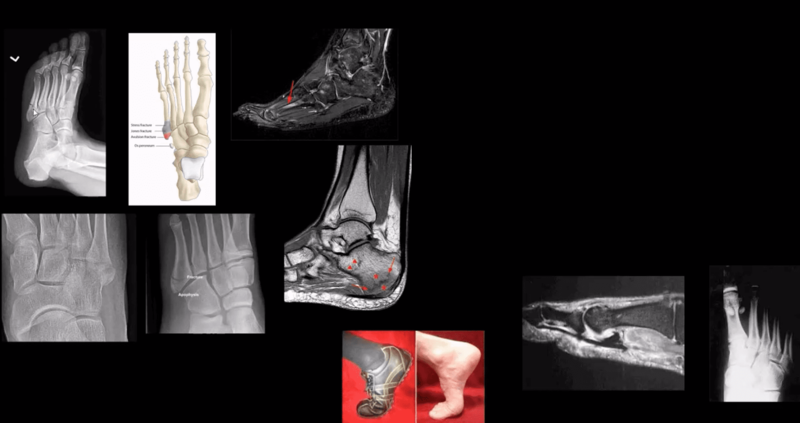 Turf toe: common athletic hyperextension of 1st MTP-sesamoid/plantar plate complex tearing. 1st MTP unstable/loose. Managed operatively. Inflammatory Arthritis: RA may develop in the ankle or any synovial joint. Will typically presents with symmetrical Hands/feet RA initially (2nd, 3rd MCP, wrists, MTPs in feet) typically with erosion, uniform JSL, juxta-articular osteopenia, and delayed subluxations. HLA-B27 spondyloarthropathies: commonly affect lower extremity: heel, ankle esp in Reactive (Reiter). Erosive-productive bone proliferation is a crucial Dx. Gouty Arthritis: common in the lower extremity. Ankle, mid-foot foot esp 1st MTPs. Initial onset: acute gouty arthritis with ST effusion and no erosions/tophi. Chronic tophaceous gout: peri-articular, intra-osseous punched-out erosions with over-hanging edges, no initial JSL/osteopenia, ST. Tophi may be seen. Miscellaneous arthropathy: PVNS. Not common. Affects 3-4th decades of life. The result of synovial proliferation with Macrophages and multi-nucleated Giant Cells filled with hemosiderin and fatty accumulation may lead to inflammation, cartilage damage, extrinsic bone erosions. Dx: x-rays are insensity, MRI modality of choice. Synovial biopsy. Management: operative, can be difficult. 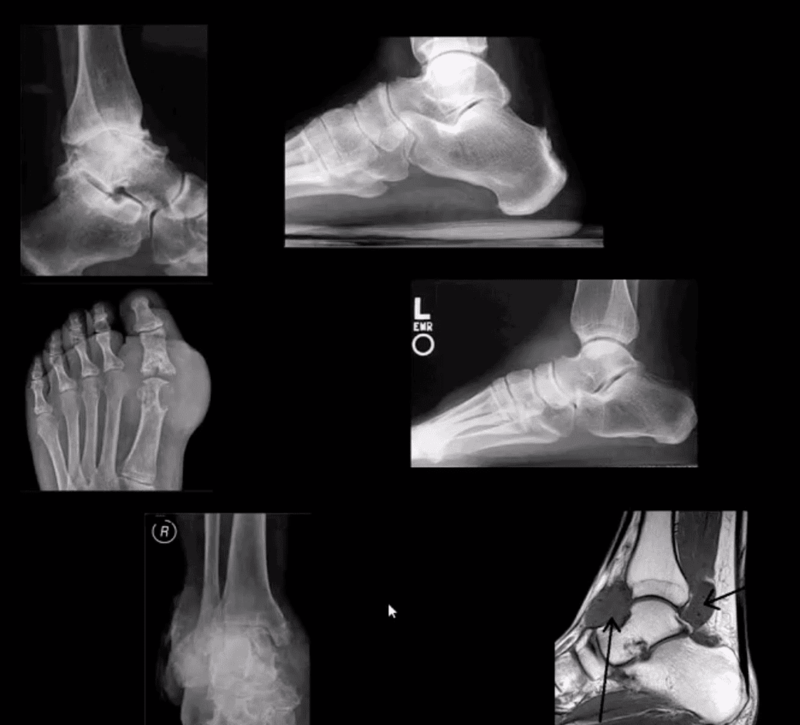 M/C mid-foot (TM joint) in 40% of cases, ankle 15%. Progression: Rocker-bottom foot, ulcerations, infections, increased morbidity, and mortality. Early Dx: by MRI is crucial. Suspect it in patients with type 2 DM especially if early non-traumatic foot/ankle pain reported.